More than 100,000 people die every year in Africa from counterfeit medicines, and that number is increasing. Adebayo Alonge (SOM ’16), a student in the SOM Master of Advanced Management program, knows all too well. He nearly died from counterfeit drugs in a Nigerian hospital. Alonge relayed that experience to Amy Kao (SOM ’17), a former consultant for the pharmaceutical industry, during the 2015 Yale Healthcare Hackathon. Today, Alonge is CEO and Kao is chief marketing officer of RxAll, a company they co-founded that’s building an artificial intelligence platform enabling spectrometers to authenticate legitimate medication. Operating chiefly in African countries such as Nigeria and Kenya, where counterfeit drugs are widely available, the platform connects hospitals and pharmacies with verified medical wholesalers, informing pharmaceutical manufacturers of counterfeit products in real time. To date, RxAll has received funding from the Nigerian government and the Nigerian Ministry of Health, as well as InnovateHealth Yale and the Yale Entrepreneurial Institute. "The product and business model have evolved over time, but the mission has always been to ensure that everyone has access to safe medicine and authentic drugs," Kao explains. "In open markets in Africa, you can buy a drug that looks identical to the one you're looking for, especially malaria medication. Even in hospitals, practitioners can't tell what is real or fake." Kao and Alonge's idea for RxAll stemmed from trying to finding ways to procure authentic medicines end to end on the supply chain. Kao describes the warehouse and logistics company as "an Amazon for authentic medicine" in Africa. "Pharmacies and companies could go to our Nigeria website and order guaranteed authentic medicine, and we were able to ship the authentic medicines to them and trace these medicines from a reputable source," she says. While this solved the issue of counterfeit drugs, the co-founders were eager to address the root cause of who supplies such counterfeit drugs. "We turned from a logistics model with our medication website to looping in data scientists at Yale to build a spectrometer," explains Kao. The process of spectroscopy involves emitting radio frequency waves on drug compounds to identify whether or not the drug is real. Despite the advanced technology required, it was important to Kao and Alonge to keep RxAll interactive. They developed an app customers could use at pharmacies when purchasing drugs: the customer could scan the drugs with their phone and receive notification of whether the product was real or fake. Kao reports a 99% match rate of the spectrometer, which has been tested with several drugs in a growing database. Kao says spectrometers typically retail for around $20,000, but RxAll's team has been able to reduce the price to $1,000, an incredible cost saving for pharma companies in rural areas that cannot afford expensive equipment. "We're still trying to make a margin selling spectrometers and selling the data component, but in the future I see RxAll moving toward a model where we provide free spectrometers to local pharmacies and monetize the data," Kao says. With the company’s expansion to over 200 pharmacies in Nigeria and Kenya, the data it gathered became increasingly valuable as a new revenue stream. "The data we collect from everyone who uses our product to identify medicine and the pharmacies they shop at has become of interest to pharma companies and regulators," Kao says. "We've transitioned into a data company to sell pharmaceutical data to global companies such as Merck, MSD Singapore and Pfizer." Kao, who never imagined herself as an entrepreneur, credits Yale's supportive environment and RxAll's participation in the Yale Entrepreneurial Institute's accelerator program as contributing factors to the company's success. 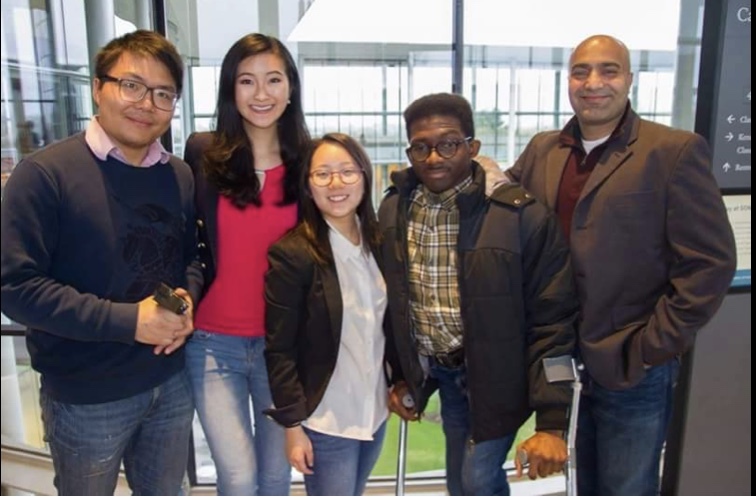 With a considerable population of international students, Yale SOM provided Kao with the opportunity to speak to students from all over the world about their experiences with medicine in their home countries. Kao connects the social mission of RxAll with the strong social impact ethos of Yale SOM. "That's one of the reasons I chose SOM: social entrepreneurship and being dedicated to both business and society was so important to me," she says. "With the data component, we're starting to see a more scalable aspect of the business, but we are still faithful to our ultimate goal and social mission." Last year RxAll was named one of the Top 15 startups by G Startups Worldwide at the Global Mobile Internet Conference in Jakarta, Indonesia. Kao said RxAll's participation and pitching at this event increased their footprint on a global scale, but particularly among the South East Asian markets RxAll is looking to target. RxAll also was accepted into the prestigious Merck Accelerator Program in Nairobi, Kenya, as well as the Catapult Accelerator Program in Norway. The latter provides $150,000 to accelerator companies, and Alonge is currently in Norway building entrepreneurial connections and refining RxAll's ideas. RxAll is also pursuing a partnership with a leading Singapore-based pharmaceutical company, after RxAll was identified as a featured startup at the Digital Innovation Summit. According to Kao, RxAll remains involved with testing drugs and spectrometers with heavily counterfeited drugs in Africa and is piloting a similar research program in South East Asia. RxAll hopes to raise $1 million in a Series A round after the completion of the Katapult accelerator in Norway, enabling it to build out the spectrometer technology and hire people full time to work on product and solidify operating platforms. To date, most of RxAll's $200,000 funding has come from grants, accelerators and bootstrapping and has covered the cost of building out their prototype, platform and team. Kao says she anticipates "taking this forward" with a clear product and business plan. She adds that RxAll is working on a few deals with pharma companies, which will be another funding source and validation of the product. Ultimately, Kao stands by the philosophy of slow and healthy growth. "Our company made a decision not to take equity from outside investors, and that was one of the best decisions we've ever made," she says. "It's tempting to talk to VCs who are throwing equity at you, but it's important to listen to yourself and what you want the company to be to make the best-informed decision." As a female lead on a largely male team, Kao encourages women who are considering entrepreneurship to take the plunge, despite the occasional difficulties women face in the startup space. "When you're the only woman in a roomful of male VCs and angel investors, you have to trust your voice and stand your ground," she says. "As a female, I encourage women to retain their femininity and not do business ‘like a man’ — I strive to understand them, not to replicate their stereotypical practices of dominance." Kao emphasizes that women often seek to connect with others by sharing their experiences, and she strives to continue offering a different perspective as a woman on her team.